Throughout Assignment 4 I have been working on an investigation into the work of the textile artist. Previous posts have been around the question “what is a textile artist?” – see discussion on Craft (18-Aug-2012 and 20-Aug-2012), textiles in Art as distinct from Textile Art (27-Aug-2012), a side-excursion on Art / Textile Art / Documentary (22-Oct-2012) and Designers and Designer/Makers (1-Nov-2012). The final requirement is to write about two internationally known textile artists. It was important to me to write about artists based in Australia whose work I have seen in life, not just photos. My first selection is Julie Ryder, seen in the photo at her artist talk during her recent exhibition Second Nature at Barometer Gallery. All of these photos were taken at the exhibition, with Julie’s permission. I love the sunlight and shadows adding even more to the complexity of the marks on the cloth. Julie trained in science earlier in her life and the knowledge and disciplines gained in that time have remained a thread in her textile works. The fabric in the exhibition is mainly antique Japanese kimono silk dyed using a fruit fermentation process that Julie developed. In simple terms, cut unpeeled fruit in half (lemons work well), arrange pieces cut side down on fabric, leave for 6 months or so to ferment, scrub off the putrid black mess and you have your dyed cloth. The complexities include measures to minimise risk with the massive volumes of mold spores created. Julie had access to special facilities, had to go through a lengthy process to determine risks and get approval for her work, and she wore appropriate safety gear when working. In fact all of the material in this exhibition was dyed by Julie fifteen or so years ago. 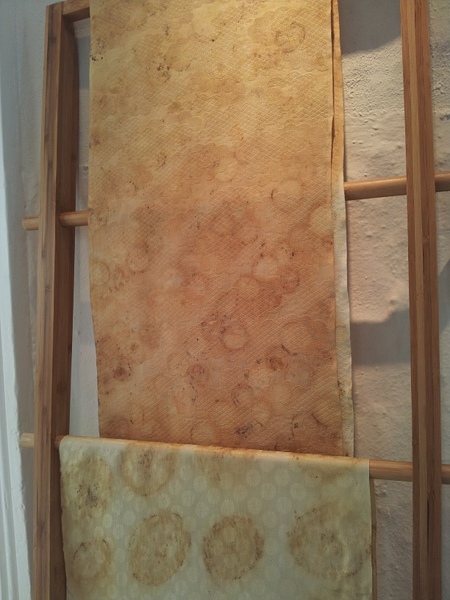 A curator was particularly keen to exhibit work in this series, Julie no longer has access to suitable facilities (and I think was reluctant to return to a quite toxic process), so she worked with the pieces of dyed cloth still available to her. The pieces range from button size to the hangings you can see in the photo, but all are human in scale. In some Julie presents the dyed cloth hanging simply, allowing the beauty of the marks on the woven texture of the silk space to speak. In other works she has combined fragments of cloth with hand stitching. 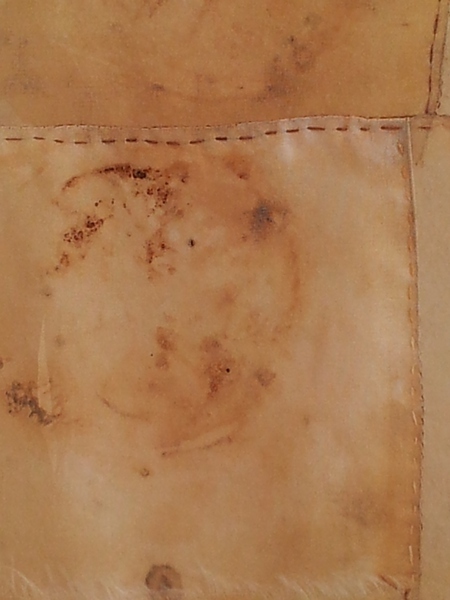 Occasionally there is more stitching on the cloth, responding to the marks that have been made. 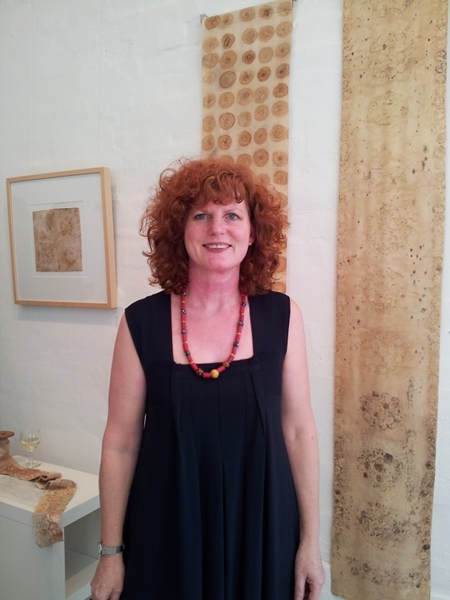 In the time between her original work with fruit fermentation and the recent exhibition Julie has extended her range of techniques as she continues to investigate her particular interests. The photo on the left is to give just a taste of that. 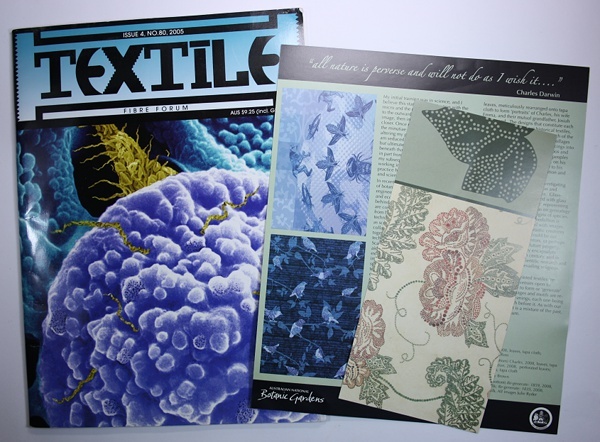 On the left is a cover of Textile Fibre Forum magazine, showing work from the 2005 artandthebryophyte exhibition(2) (I didn’t see this exhibition myself). On the right are leaflets I picked up at generate, an exhibition at the Australian National Botanic Gardens in 2008 inspired by Charles Darwin (3). The digitally printed silk organza on the magazine cover, colourful and crisp, seems a world away from the natural dyeing of the fruit fermentation. For Julie it was a logical progression. Faced with restrictions on bacteria she could use in dyeing, she used a scanning election microscope to examine the structures of micro-organisms. 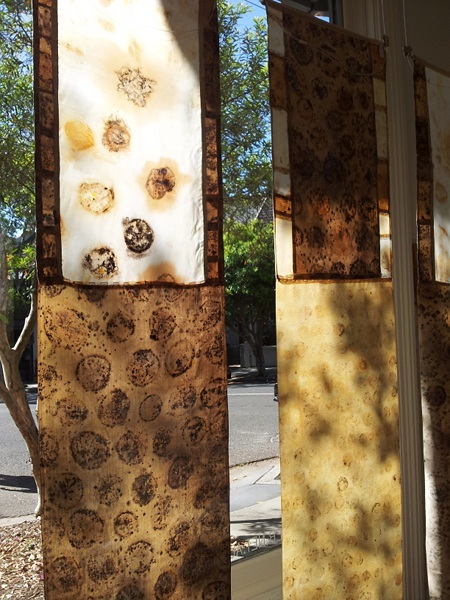 The photomicrographs became the inspiration for digital printing, although she retained an element of hand work and connection to the cloth in the post-printing finishing. The works also reflect the research Julie undertook on the history of botanical science, systems of naming and more. As well as the printed silks Julie printed on paper and used collage and assemblage, using the drawers of a large cabinet of drawers to create a contemporary cabinet of curiosities. Generate explored the life and theories of Charles Darwin. As well as lengths of digitally printed silk, Julie went through a painstaking process of hand-cutting circles from leave then arranging the dots on tapa cloth to create images based on Charles, his wife Emma, and grandfather Josiah Wedgwood. These ‘portraits’ use symbols from historical textiles to represent their subjects. From memory, the actual leaves with all their holes were arranged in a drift along the base of the display cabinets. There was also a glass ‘tree of life’ – glass branches and glass medallions incised with fantastic creatures. 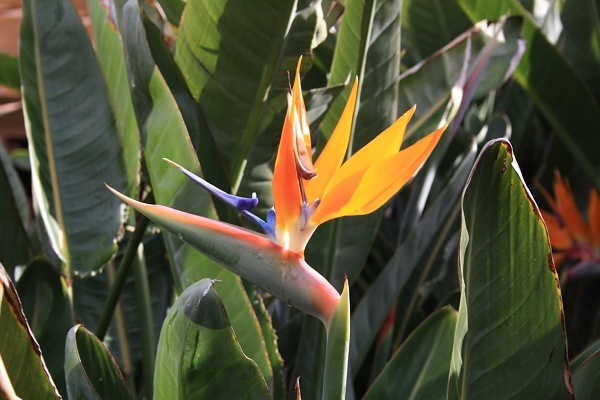 There are multiple depths of meaning – for example she used both native and exotic species of leaves “to show how cultures like introduced species react” (4). Overall it seems to me that Julie’s work is heavily ideas and research driven with a disciplined, scientific approach. She is interested in what lies underneath, not obvious – often at the micro level. Frequently her subject matter is botanical or biological in nature. In most cases her work involves creating colour on cloth. Julie uses a mix of traditional and modern techniques and materials. However leaving those generalisations she seems to engage afresh with each new area that interest or opportunity leads her to. Julie brings all her past knowledge and experience and skills to her present work, but she doesn’t force them onto or into it. She researches and responds to what she learns, developing new themes, new symbolic imagery, new techniques and processes each time. I’ve listed some links to more information on Julie and her work below. (3) (2008) Generate: Julie Ryder. Exhibition leaflet. Australian National Botanic Gardens; ACT Government. OCA frequently runs study visits for students in various disciplines. Last month Lizzy wrote an exciting post here, about a Textiles Study visit to Whitworth Gallery in Manchester led by tutors Liz Smith and Pat Hodson. It sounded wonderful, with preparation and tasks and group discussion. I was very jealous. It’s 30 years since I was last in the UK and I can’t see a trip happening any time soon, so no study visits for me (cue mournful music). Trying to content myself by living vicariously I read the various forum posts of students on the visit. I also contacted Lizzy and OCA, and Liz Smith was happy to send me her briefing notes, visit plan and a sheet on a Critical Approach to viewing works of art. Then Claire and I came up with a Plan – we would have our own Textile Study Visit. 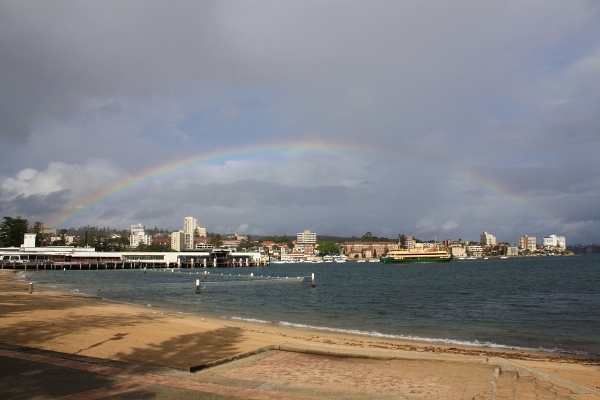 Today we met up in the city, and caught a ferry over to Manly on the north shore (note yellow and green ferry plus fortuitous rainbow). 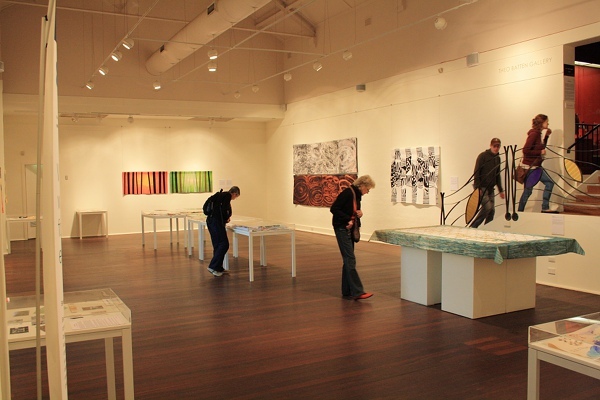 Our destination was the Manly Art Gallery and Museum which currently has three textile-related exhibitions showing. 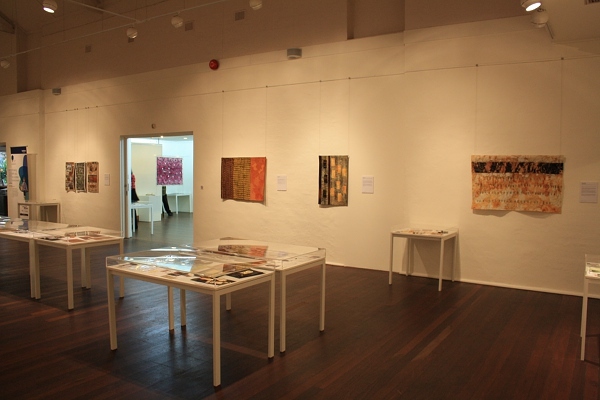 Contemporary Quilt Textiles is a biennial juried exhibition, a collaboration between the Gallery and the Quilters’ Guild of NSW. 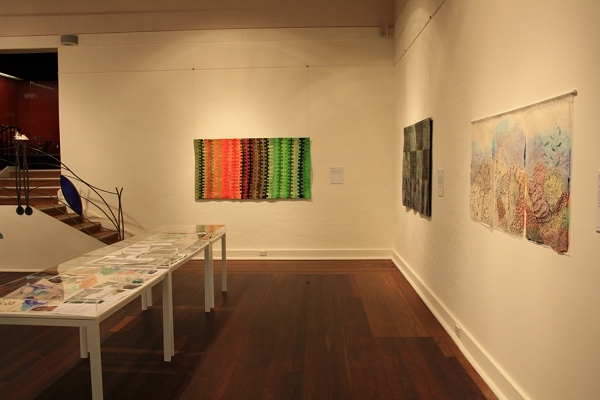 The Gallery is running a number of events in conjunction with the exhibition, so Claire and I timed our Visit to include a discussion on narrative threads in contemporary textile art by Australian textile artists Liz Williamson, Cecillia Heffer and Paula do Prado. Theme 1: The stories behind the works. From the catalogue: “We know there is heightened public interest in the stories behind the material object – who made it, how, why and with what intent – for whom?” The exhibition has “creative process displays [which] complement and enrich the primary display of the finished art quilts”. How is this done? Is it successful? Should artworks speak for themselves, giving space for the viewer to participate in giving meaning to the work? Theme 2: regeneration. A variety of general approaches/responses to the exhibition theme were identified based on information in the catalogue – the human condition; the natural world (fiery regeneration and Other); process/technique. Select one of these for further investigation. Do the works identified actually fit the sub-theme? What are the differences in approach within a theme? Does one of the works particularly appeal to you or appear more successful? Why? Use the Critical Approach list to examine that work. Theme 3: technique. The catalogue highlights the use of computer technology and in particular photography and image manipulation. There is also a wide range traditional textile techniques, some of which may have been applied in new ways or to new materials. Select one or two works which demonstrate these trends and contrast their approaches. Theme 4: narrative threads in textile art. Based on material in the catalogue or your own scanning of the exhibition, select one or more works which illustrate the use of narrative threads in textile arts. Use the Critical Approach list to examine the work in more detail. Consider the nature of the narrative and how well you feel it has been communicated in the work. The gallery staff were incredibly friendly and helpful. In general photography is not permitted in the exhibition, but they allowed us to take general photos of the rooms as long as we didn’t focus on particular works. Later when we wanted to spend some time focusing on our Selected works, they fetched chairs for us, and even offered a cup of tea at one point. We started by going around the two rooms of the exhibition, getting a general impression and choosing one work in each room for detailed study. The tables you see in this photo contain the “creative process displays” which are intended to “complement and enrich” viewing of the finished art works (quotes are from the catalogue). I had mixed feelings about these. I found it hard not to look at the process displays before spending time with the actual works. There was a lot of variation in the contents – I think the artists had mixed opinions too. The first piece I focused on was Black Water #32: into the light… by Judy Hooworth. It’s the diptych right of centre, a light colour piece over a brownish one. (Check the catalogue pdf – link above – for a better photo). I sat with it a long time, considering content, form, process and mood as suggested by the Critical Approach notes. The amount of information available in the catalogue and process display was almost too much. For example while I was attracted to the scribbly swirls of the work I didn’t see them as abstract – they were clearly representational of the ripples of water in the rain. I might have wondered about ecological concerns being expressed, not knowing of the artist’s personal journey of grief and loss expressed through depiction of a favourite location. In the talks later both Cecillia Heffer and Paula do Prado spoke about works that were private. They still made the work, but chose not to include imagery, instead allowing their audience to find their own story and meaning in the work. Cecillia described it as gaps, silences and unanswered questions in another’s story. Originally I had thought my timetable for the day allowed ridiculous amounts of time, but after intense focus on just one piece I was ready for lunch. Claire and I walked back to Manly Wharf for some very nice thai food, and a great chat about our assignment work and what everyone’s doing (all the student blogs really help in feeling part of the student community). I’ve added some photos of the plantlife around, just for some local colour. After lunch we returned to focus on a work in the second room. However we didn’t have much time before people started arriving for the scheduled talks. An advantage was that I could take a photo of an individual artwork. 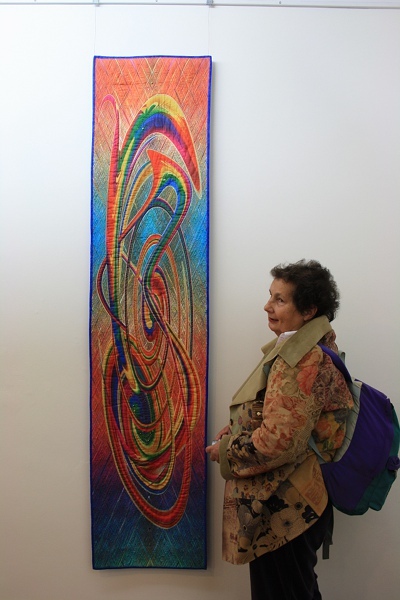 This is Toni Valentine with her work Regenerating Colour. The speakers were all interesting. Cecillia Heffer illustrated her talk with a series of slides of her works, but rather than commenting on them directly she read from letters she wrote and received while developing them. Lace is her major focus, organising spaces as well as the solid motif, and she talked about the gaps and spaces of our homeland, of absences and immigration. Paula do Prado has just completed her Masters at COFA. An immigrant to Australia she talked about inclusion and exclusion, about cloth as an archive and capturing the family history and knowledge she fears losing. Liz Williamson started by saying that every textile has a story attached, even the (very ordinary) tablecloth on the speakers’ table. She talked about textiles reflecting a peoples’ attitude to the world, for example in an area of India where weaving is predominantly men’s work, and embroidery women’s. A later slide showed Xanana Gusmão around the time East Timor gained its independence, wearing a scarf woven on a backstrap loom – a particular cloth, woven in a particular way, using particular motifs. The meaning, the sense of place and time that a textile can give! Overall I feel our first Study Visit was fun, worthwhile and exhausting. It’s a strange approach to scan the works as a whole and then focus deeply on just a few. I think that Claire and I to some extent both felt we were somehow not showing full respect to those artists whose work we didn’t concentrate on. However I wouldn’t have the time or stamina to give that level of attention to all. By making selections I was able to clarify some of my own interests and objectives, as well as gain a deeper appreciation of those works. I definitely want to use the Critical Approach again, but probably with some rebalancing of time so I have a bit more of a general understanding and appreciation of the exhibition as a whole. I’ve been working on this post a while now and it’s still not finished. I’ve been thinking about the future of craftsmanship and particularly handcrafts, the relationships between design and craft and designers and craftspeople, what authenticity means… . Recently I posted here about a lecture given by Amanda Talbot at the Powerhouse Museum. Titled “Preserving the Past to Make Our Future Happen”, the blurb on the website points to the need to learn from the past, rediscover lost skills and secure the knowledge of “the final generation with specialist craft skills”. To me a lot of what she said was about opportunities for designers – to find and use crafts and craftspeople, to engage with consumers. This was as advertised, but not what I was looking for – which was more about craftspeople preserving skills and knowledge, and the challenges of making a living through their craft if that’s what they choose to do. 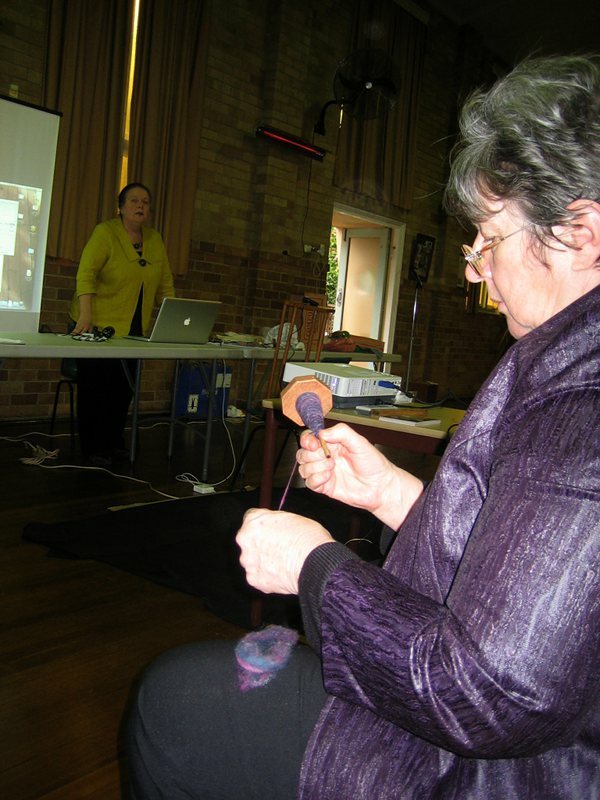 A couple of weeks ago at the Hand Weavers and Spinners Guild of NSW we had our first simulcast meeting, reaching out to members many kilometres from Sydney. I love this photo – our President, Ann Beatty, in the foreground busy spindling while listening to committee member Ann Jackson (techo and spindle queen) introducing the new facilities. This for me is the essence of preserving handcrafts – individuals building and passing on skills, learning and sharing, bringing in new ideas and materials but also valuing the traditional. People working with their own hands, creating, is the core. The object created is important. Good design is important. Building understanding and appreciation among consumers of handcrafted goods enriches the lives of those buying and those selling. Projects to provide opportunities and a market, to empower people or communities through trade – very worthy. 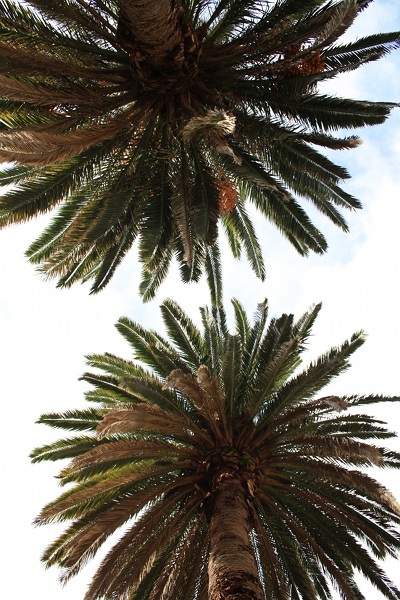 Globalisation of production – I concede some points but there are issues. Back to the Guild simulcast. It was very impressive. The smooth running is a testament to the effort and preparation of the organisers, who had tested connections, found alternatives, rehearsed presentations, addressed issues of privacy and copyright… The focus is on members who can’t get to meetings and potential members around the state – but for me an immediate benefit for the “locals” was having the detail of a demonstration displayed up on the screen. The main presentation was about Ravelry. While I’m a member I’ve explored very little of it, and it was really interesting to see some of the possibilities. I hope the distance participants found it a satisfying experience and that this venture continues. A demo of Facebook was also planned, but didn’t go ahead partly on time but also with the comment – “there’s no point after looking at Ravelry. That is the future of social networking – linking people with shared interests.” Which brings me back on topic – if craftmanship is about people and my concerns about preserving and sharing skills – how fabulous is the internet? 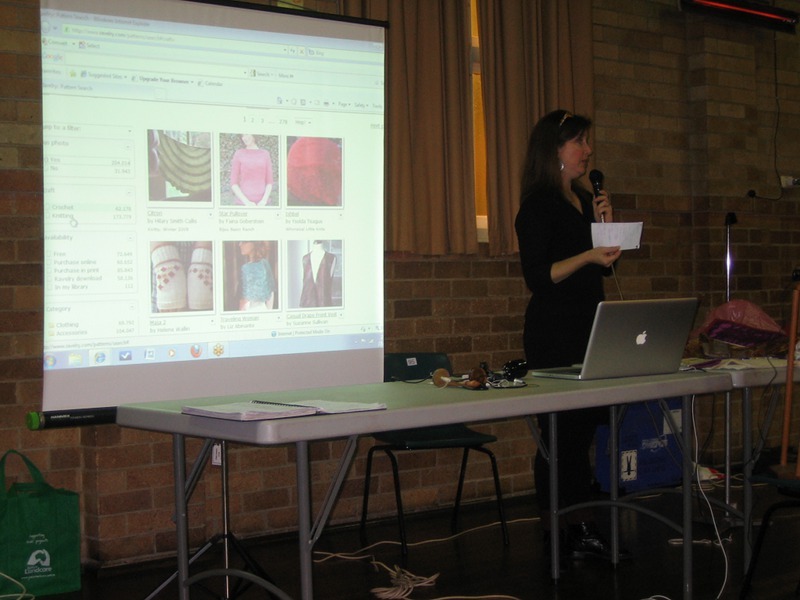 As well as Ravelry there’s weavolution and blogs and ventures like P2P2 and of course YouTube… Incredible rich resources. I’m beginning to collect quite a few bits of discussion on developments in handcrafts and consumer perceptions and values. I haven’t done any conscious research yet, but suspect this will be an ongoing area of interest for me (and maybe others), so below am listing some of what I’ve found so far. There’s rather a lot and undigested – no conclusions – so you are warned!